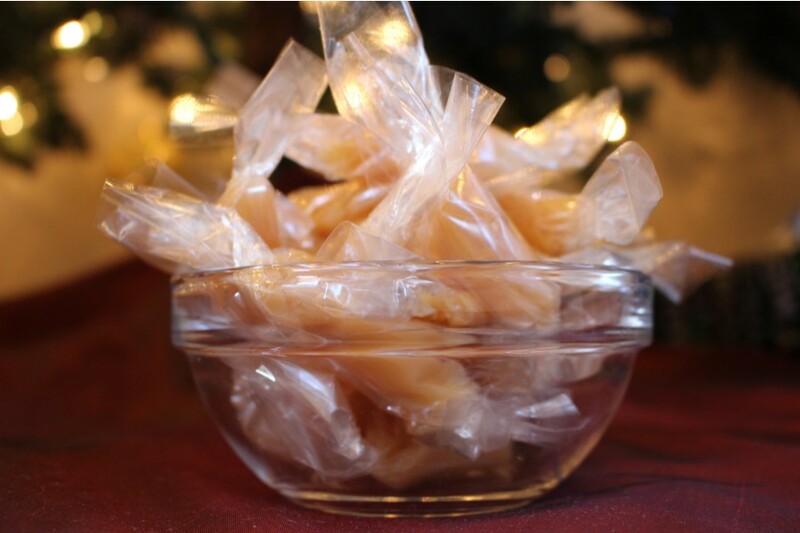 My favorite Christmas treat to make would have to be these chewy, soft caramels my grandma used to make. Every year my family begs me to make these and every year they're a hit. Mix all ingredients in heavy sauce pan, stirring constantly. Heat to 235°* or soft ball stage* (low heat so you don't burn it). Pour into a cookie sheet or 9x13 pan (for thicker caramels), well buttered. Cool. Cut into bite-sized pieces and roll in waxed paper. *Temperature for soft ball stage will vary according to elevation. To figure out what the perfect temperate is for you, watch your candy thermometer as water boils and as soon as it boils, note the temperature. Water boils at sea level at 212° so if water boils at your elevation at 210°, you are going to want to adjust the temperature above down 2°. When cooking in northeast Orem, I cooked my caramels to 228°. If you cook your caramels according to the "soft ball stage" line on your candy thermometer and you're at elevation, you will have cooked it too long and caramels will be hard. *Another way to make sure you're getting it just right is to do the cold water test. Just before you start, get a mug of ice-cold water with ice cubes in it and put it by the stove. When you think the caramel is ready, drop a little into the ice water. It will cool within a second or two and then you can fish it out and make sure it's the right consistency. You want it to be soft and chewy, but not runny enough to stick to your fingers (or the paper) or that makes it hard to wrap. If it's too hard it won't be as soft. Those look so good. I love family recipes.